The head of house, James Galt, was away fishing when this census was taken. My mother grew up in such a house in Banff. At the top of the steep Campbell Street, where it enters into St. Catherine Street, my Grandfather bought a nice house, and baptised it"Primrose Hill". In the summer of 1999 I was shown inside this house for the first time by the nice old couple living there. They also showed me the loft where grand-dad used to store his nets and gear, but now it had been turned into extra bedrooms. The backgarden was spacious, and when strolling around in it, it brought back memories of stories my mother had told me. Here she kept all the strange objects and animals her father brought back to her after weeks at sea - once he brought with him a baby seal. My mother kept her pet seal in a tub in the backyard, and carried him down to the seaside every day for a swim. She also had a monkey and a dog. I presume her elder brother - Sandy - accompanied his father to sea, so it must have been a hearty welcome every time they returned back home. On the night of 13th December 1908, the Zulu sail boat "Atalanta" (BF 625), belonging to Portsoy, was struck by the cargo steamer "Perth". The collision occurred shortly after the "Atalanta" had left Lowestoft for The journey home, at the end of the Autumn herring fishing season. Two of the crew of seven were lost. The "Atalanta" was built in Buckie in 1901. On 8th of December 1923 subsequent to 4.30 a.m. in the Moray Firth opposite Fordyce Parish, Banffshire died aged 48 ; son of John Goodbrand, fisherman. Cause of death : accidentally drowning while engaged as a fisherman In the Motor Boat "Sovereign" (BF 1708) per verdict of Jury. (Two other fishermen drowned in the same accident). (3 other men on board "Taylor" were also drowned). One of the worst fishing catastrophes in Scottish history occurred in the Moray Firth in August 1848. Over 800 boats put out to sea from Wick on the afternoon of Friday 18th , stood out some ten miles to sea and shot their drift nets. By midnight it was evident that the weather was changing for the worse - the wind increased and the sea turned rough - and many skippers decided there and then to haul their nets and make for shelter. These were the lucky and wise ones. In all, along the east coast, that storm accounted for 124 fishing craft and 100 men, who left 47 widows and 161 children. This unpredictable way of living through centuries led to a deep closeness and feeling of solidarity among the fisherfolk, developing distinctive "tribeslike" manners of coping with daily life. Intermarriage was almost a rule in the fishing communities. Boys usually married in their early twenties, girls even earlier. Women had a very special place in these communities. 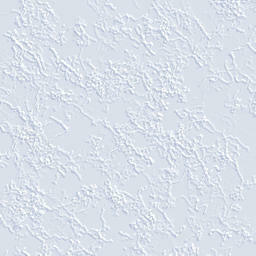 They participated wholly in their husbands trade and led a laborious life. 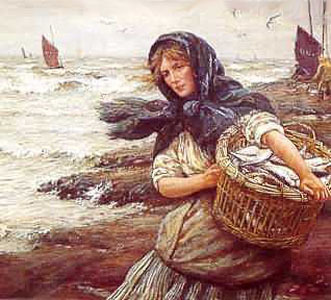 No woman from "the outside world" was considered physically or psychologically fit to cope with the stresses and the workload involved in the standard practice of line fishing - gathering bait, sheeling mussels, working with sharp hooks, gutting and trudging miles with her creel to sell her husband's catch day after day. Children of fishermen were known to almost invariably follow the occupation of their fathers. This practice of intermarriage led to the people in these fishing communities sharing a small stock of surnames. 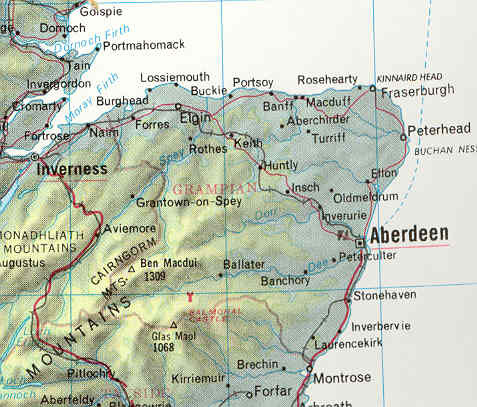 Certain names have been associated with particular places for generations : for instance Burgon with Eyemouth, Patience with Avoch, Coull and Tate with the Buchan area. My Grandmother's family and ancestors - the Goodbrands - were associated with Whitehills. 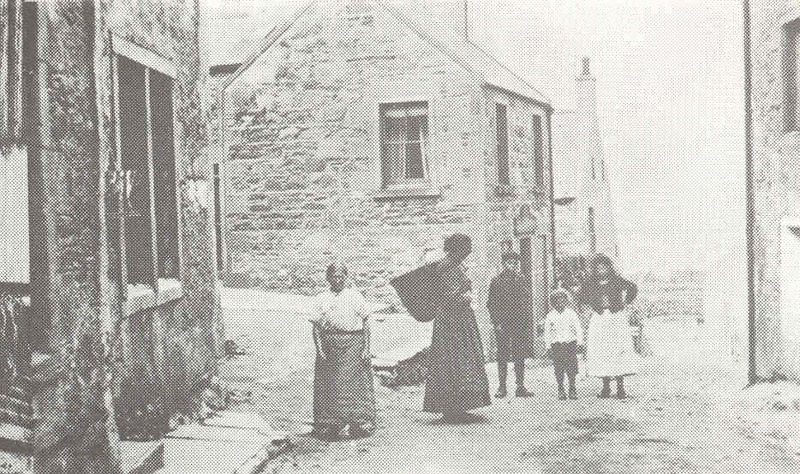 In the village of Downies, to the south of Aberdeen, 236 of the 249 inhabitants in 1870 shared four surnames - Wood, Main, Leiper and Knowles - and the other thirteen households were not connected with the fishing. In this situation the use of nicknames was widespread - and really a necessity to be able to communicate at all. It was common for men to be known by the name of their boat, but many more nicknames were more imaginative. One of my mother's cousins - James Bruce - everybody knew as "Cackie", and my Great Grandfather's tee-name was "Old Daisy". My limited family reseach has brought up 10 Alexander Gaults and 6 Davids, and on the Goodbrand side : 6 Alexanders, 7 James' and 6 Johns. Men named Alexander were either known by the name Sandy or Alick, and if there were too many Sandys, my mother used to keep them apart by emphasizing that "I mean oor (our) Sandy". "Doddie" was a tee-name for George. Some of these fishing villages were in existance before 1500. In 1677 Portknockie was founded by men from Cullen. In 1716, Thomas Ord created Findochty by settling it with thirteen fishermen and four boys from Fraserburgh. Macduff grew from a small place in 1732 with only a few fisher houses to a large village of 1000 people by 1790. There are also plenty of tales about the stranding of foreign vessels in the past, and the shipwrecks building up new communities, for instance Newhaven (dutch) and Rosehearty (danish). Partly due to the large scale immigation of fishing people from the eastern regions to the Kintyre area in the west during the 17th and 18th centuries - Gaelic almost became extinct as a practising language. My mother's hometown Banff have preserved records dating back to hanseatic times in the 12 century, and probably was a trading center for northern Scotland, like Bergen was for the western part of Norway. 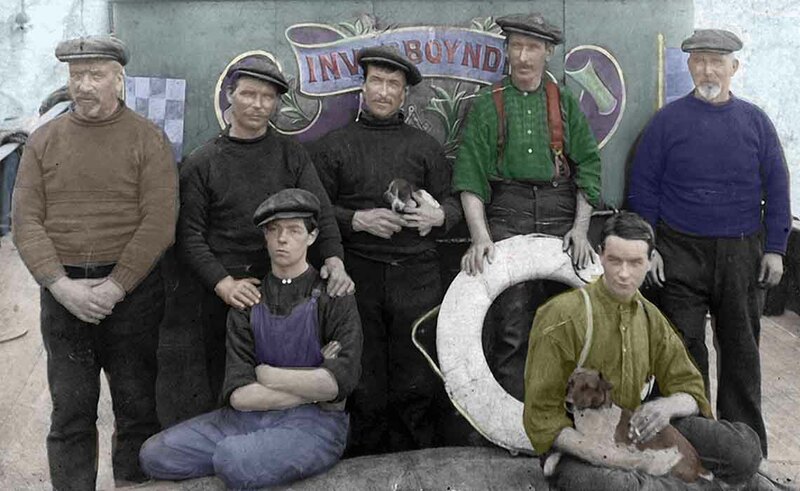 Fisherfolks were easily recognised by their way of dressing. It was important with warm, weatherproof clothing going out to sea. 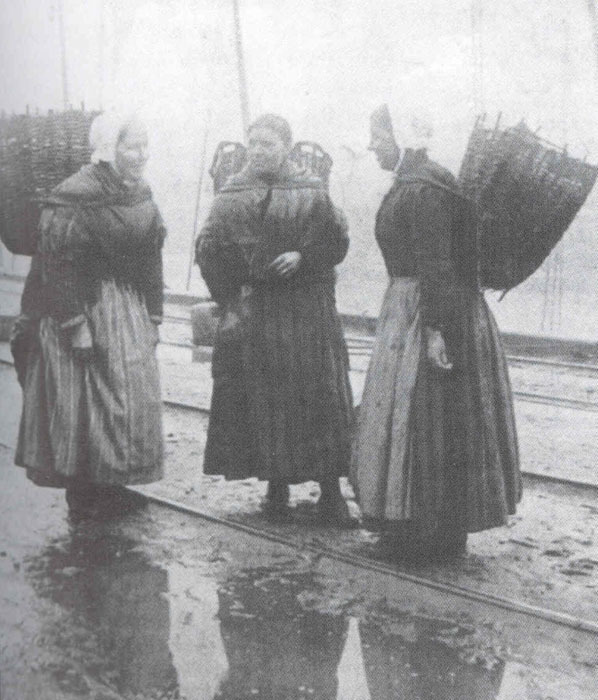 In many places with no proper harbours it was a custom womenfolk carrying their men out to their boats to prevent them from getting wet on their first working day. 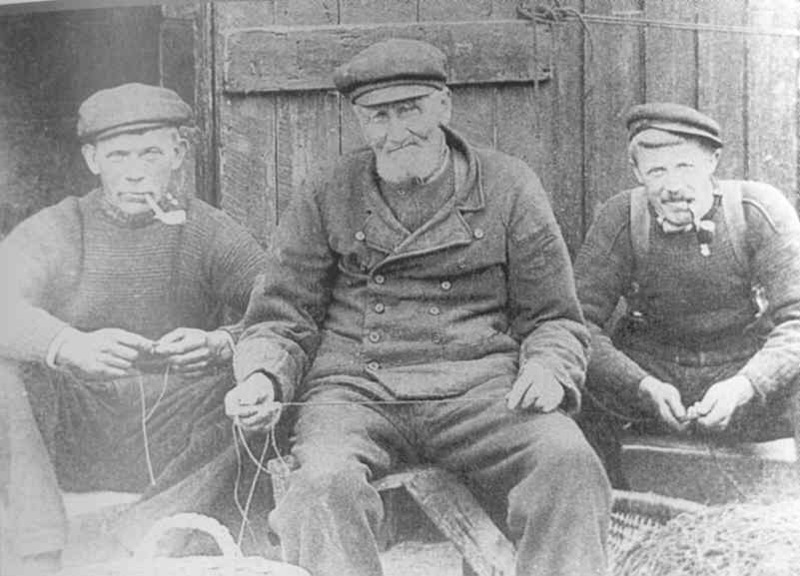 The fishermens garments were treated in various ways to make them waterproof. Before the advent of oilskins in the 1920s, fabric might be coated with linseed oil or an oak bark mixture (barkit). Thigh boots made from leather were obligatory. The leather was also often treated to keep it waterproof. In some places cod liver was melted down and mixed weith tar or lard for this purpose. Flannel undergarments, waistcoats, thick jerseys or ganseys, thick blue trousers and heavy jackets were worn. Scarfs kept water from running down the neck. 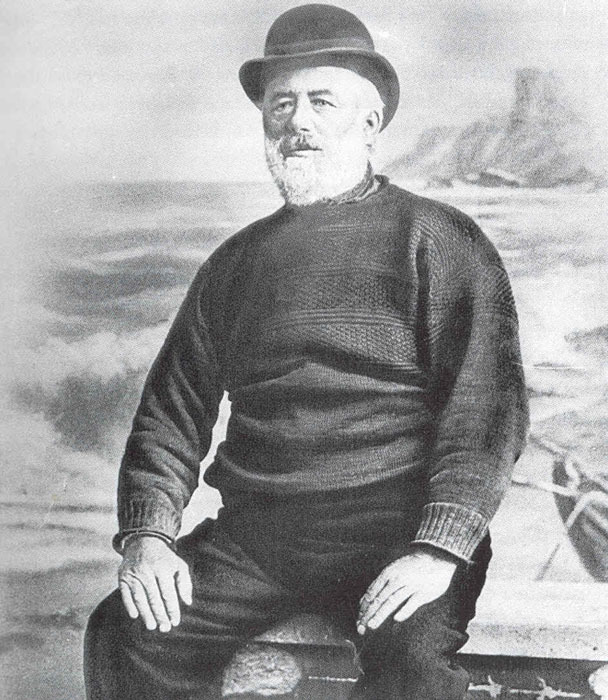 Sea-going wear often had no buttons lest the fishing lines would catch in them. Rubber boots made their appearance in the 1930s, and by this time oilskin smocks - usually bright yellow - were also common. Fashions varied from place to place, but generally - when ashore - the fishermen favoured dark-blue, double-breasted suits and flat bonnets. 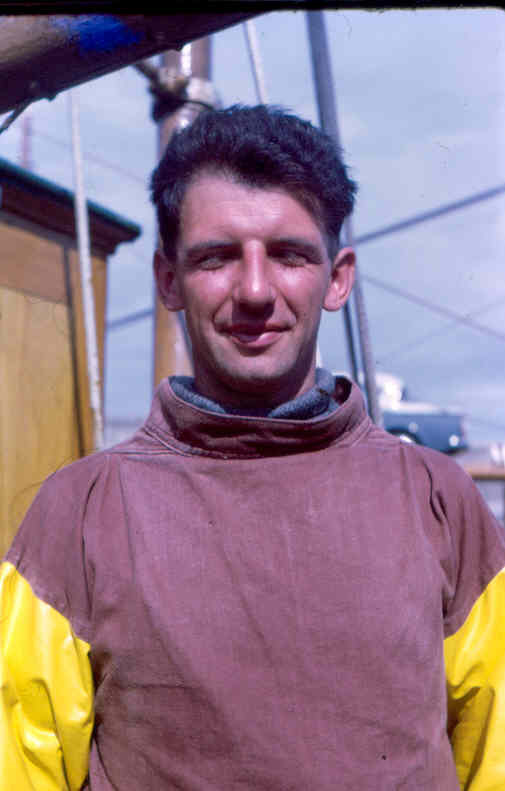 Older fishermen considered themselves properly dressed in their jerseys or ganseys. In older times a fisherman's home district could be told from the pattern and style of his gansey. 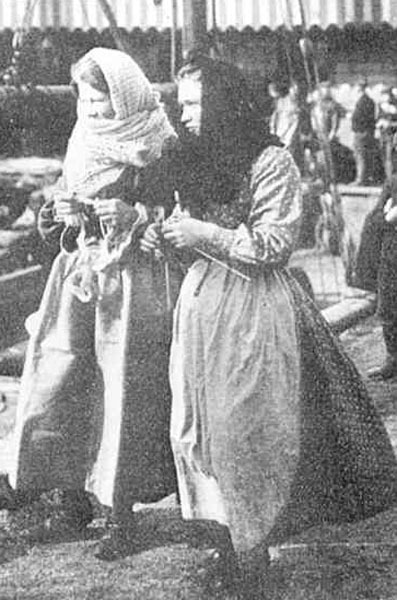 The fisherwomen were easily regognized in their distinctive striped skirts, dark capes and headscarves, wearing white stockings and shoes like slippers - and displaying the creels of their trade. The women of Newhaven had particularly colourful costumes of white flannel skirts with red stripes under an outer petticoat with yellow stripes on the inside. The shawls and blouses were elaborately patterned. They were nicknamed the "yellow butterflies". In the north-east the fishwives from different villages had distinctive patterns for their plaids : red and black dice in Inverallochy and Cairnbulg, blue and black in St. Combs, black and white in Broadsea, grey and white in Pitulie and natural brown in Rosehearty. 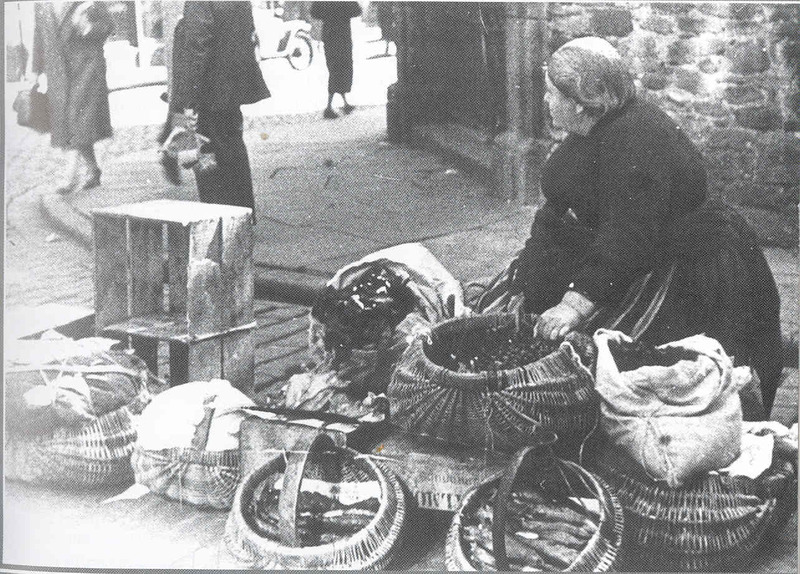 The woman usually worked in groups of five or six to buy a box of fish at the quay and then divide it amongst themselves. Then each women with her chosen share would load her creel and smaller basket called a scull, weighing a total of one hundredweight (50 kg) of wet fish, on her back - the weight taken on the forehead with a headband. A large repertoire of taboos and superstitions were observed in the fishing communities. Some beliefs were local, but many were common to all European seafarers. Some animals and their common names were taboo, in particular the pig, the rabbit, the hare and the salmon. These were referred to by other names, such as "himsel" for the pig, "red fish" for salmon and "langlugs" for the hare, and inadvertent use of the wrong word would provoke the response "cauld iron" and the touching of the nearest piece of ferrous metal. Many of these superstitions can be traced back to belief in witchcraft, and a collective term for them in Scots - "freets" - is derived from the word fruit, meaning the good essence in an object that could be stolen by a witch or evil spirit. What is interesting is that these superstitions, which were once probably much more prevalent in society at large, survived longer in the fishing communities. I remember my mother being quite superstitious. Things that fell to the floor always meant something special - a prewarning of the arrival of someone. Different kinds of objects could not be put on the table or used inside the house. When these taboos were inadvertently broken by us children, my mother always had to "touch wood". My mother's special gifts in fortunetelling from tealeaves soon were widely spread outside our community. We children always used to tease her saying : "If you had lived in another century they would have burned you as a witch." A sense of religion was also very strong in most of the old communities, and the scottish fisher people held steadfastly to their faith. The nineteenth century was generally a time of strong religion - the break from the Church of Scotland to form the Free Church in 1843 affected all sections of society - but the fisher people were often particularly noted for their observance of the Sabbath and attendance at worship. Around the coast, the Sabbath was generally looked on as a day of rest for fish as well as men, and no fishing was carried out. The Salvation Army became a respected, prominent institution in many fuishing towns, along with the Royal National Mission to Deep-Sea Fishermen, founded iin 1881.The Babtist church was also strong. The herring fishing in the early years of the nineteenth century was marked by a considerable consumption of whisky - a bottle each day was part of the contract between some skippers and curers - and it is perhaps not surprising that an abstinence movement became bound up with religion as the century went on. Many fisher communities had their societies to fight the "demon" drink. 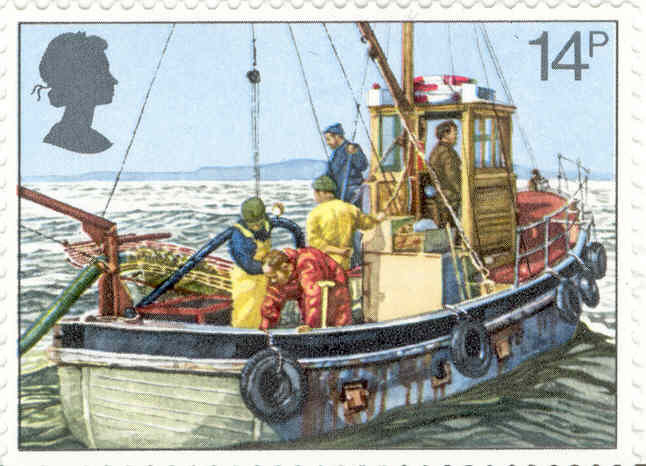 The fishing crews used a range of methods to ensure a fair division of the catch. In Golspie, for example, there were two ways of doing this. In the first, the crew, usually four men, would make four equal piles of their catch, turn their backs and ask a neutral passer-by to call out "Co leis seo ?" (Whose is this ?) while pointing at one of the piles, to which a crew member would respond, and this calling was repeated until each man had claimed a pile. The second method, a refinement of the first, involved the use of tokens, in which the passer-by took the tokens of the crew members and put one on each of the piles. The ownership of the tokens - a stick, a cap, a stone, a knife, any small unique object - would be known only to the crew, and different ones were used at each share-out so that no man could come to be known by his token. The use of sticks as tokens was widesoread and has a long history, the Scots word for this special stick being "cavel" or "kevill", and the whole selection process being known as casting the cavels. Fishing has been going on in Scotland since prehistoric times. Fishbones from archaelogical sites proves that even off-shore fishing from boats must have taken place. It is uncertaiin what kind of vessel they may have used, but probably they were partly made from hides. 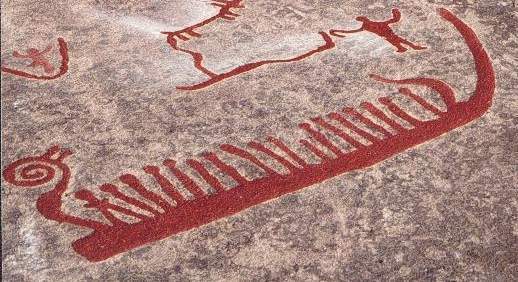 The Norwegian professor Sverre Marstrander and Paul Johnstone tried to reconstruct such a hide-boat in 1971, based on a rock drawing at Kalnes (in the vicinity of Sarpsborg - my birthplace). The boat was made from eight cow hides over a frame of alder and lime, and proved to be seaworthy in at least inshore waters. 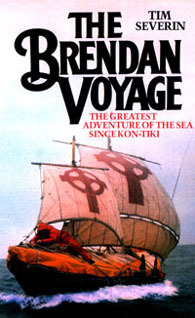 The replica hide vessel "Brendan", built by Tim Severin in 1976, was strong enough to cross the North Atlantic via the Faroes and Iceland. Researchers reckon that the prototypes of the Scottish fishing vessels originates in old Scandinavian designs. 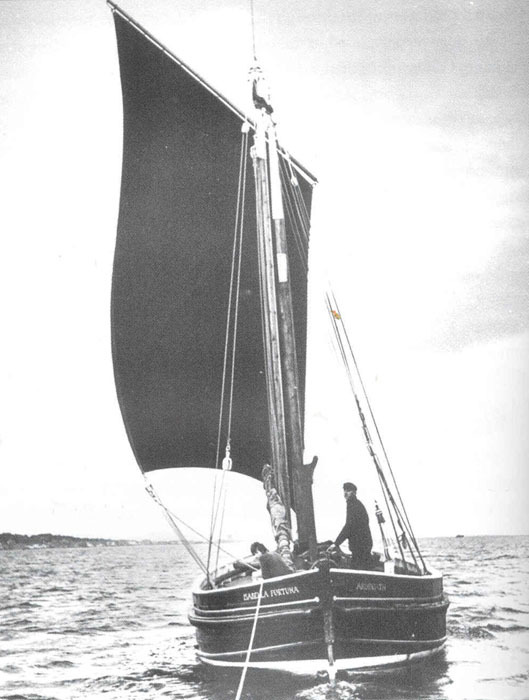 The Norse heritage seems very clear in all the old forms of Scottish fishing boats - in the clinkered planks or strakes, in the double-ended design of the hull with similar stem and stern, and in the method of building whereby the keel and the lower strakes are put in place before the strenghtening ribs. There are records of Norwegian boats being imported to Shetland in paast centuries, for example, in 1566-67 when seventeen boats were carried from Bergen, in 1620-21 when another seventeen arrived, and in the mid-1740s when a Shetland cargo vessel brought home from Sørøysund in Norway eight six-oared boats and twenty-four four-oared boats as well as timber and tar. From old accounts it seems the boats arrived in kits - ready shaped and dressed - and put together in Scotland. It seems the yole (Fair Isle yole, Ness yole) was an archetype. These were slim vessels, 20 to 22 ft in length overall over a 15 ft keel. They were equipped with oares and a single mast with a square sail. They were easily pulled out of the water, and were widely used in inshore line fishing. The larger fourareens and sixerns developed from these yoles, and was needed for working further offshore and carrying bigger loads. The Shetland sixerns represented the peak of development. They were in the main 30 ft long. Despite the name, some sixerns had eight oars. The hull space was divided into a series of compartments or "rooms" by slatted partitions : at the stern was the “shott-hole” where the skipper sat, and then came the "shott" or "run" where ballast and fish were stowed ; the "owse-room" for bailing ; the "mid-room", in effect the working area where the lines were shot and hauled ; the "fore-room" with more ballast and the site of the fire kettle ; and the "head-room" and "bow space" where sails and gear could be stowed. The sixerns became the basis of the line fishery from the early 1700s until the beginning of the twentieth century. 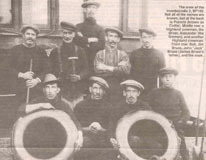 At its height in the early 1800s, nearly 500 sixerns and 3000 men were working in the haaf fishing in Shetland (from the old Norse word for sea). 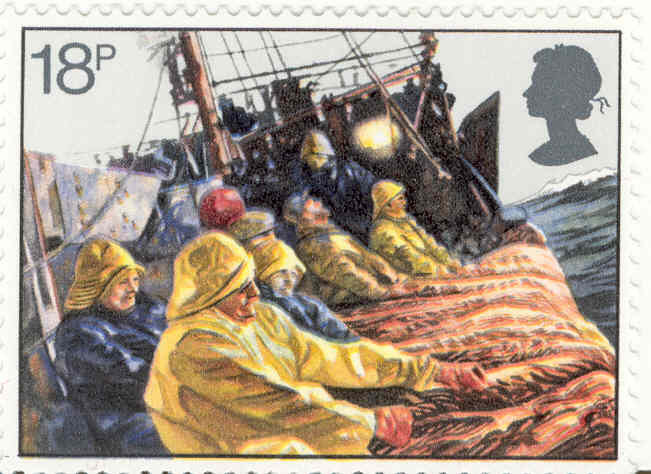 Relying on the superb seagoing qualities of the sixern, the crews fished in deep water in stormy weather, often out of sight of their home islands, using five or six miles of line to hook cod, ling and halibut. Navigation of the sixerns was carried out by the skipper according to his skills. A glimpse of the sun at a particular time of day, the flight of seabirds, often gave him the clues needed to navigate home. In foggy weather, foghorns made from the horns of cattle were common. But the most common navigational aid was the use of landmarks - hilltops, kirk spires, the openings between islets. 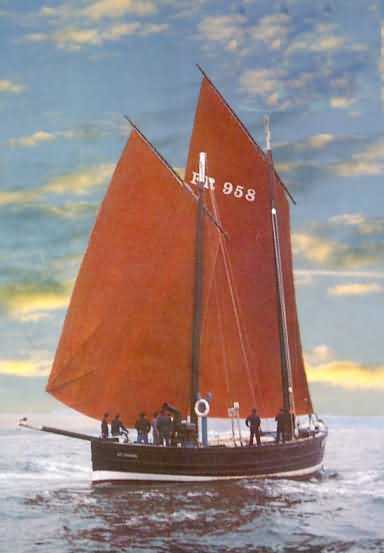 Another kind of vessel, used by the fishermen from Lewis, was thr sgoth. It was 33 ft long with three thwarts. There were six or seven men in the crew. Still another kind of vessel, similar to the sixern and sgoth, were used in the Orkneys. This kind had a more rounded keel, used for the transportation of cattle and sheep between the isles. By far the most common type of vessel along the entire east coast of Scotland in the early nineteenth century was the "Fifie". The name indicates that it was designed in Fife. The fifie measured originally from 25 to 30 ft in length, but grew considerably in size througout the later decades of the century as crews ventured further from land in pursuit of larger catches of herring, until some touched 75 ft and were registered at 25 tons. With a vertical or only slightly raked bow and stern, they preserved traces of their Norse heritage in the clinkered planking, although later carvel-built vessels became common. A consequence of the great disaster of 1848 was the construction of a foredeck for better protection of the crew in bad weather. 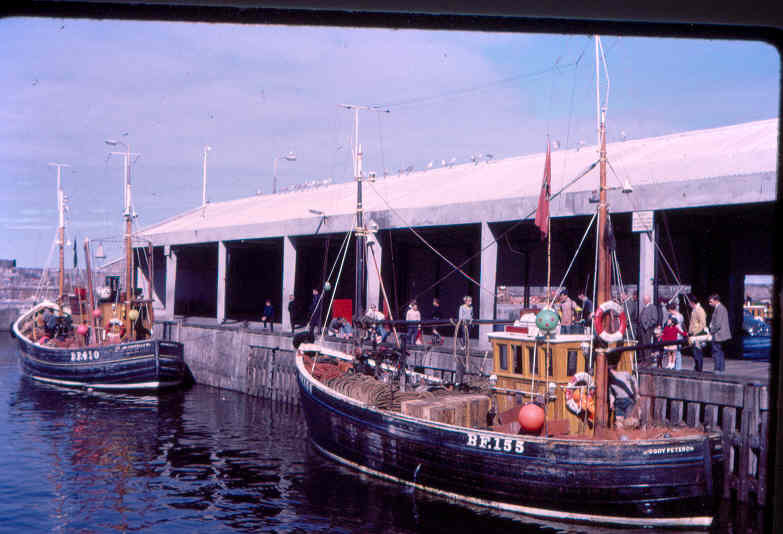 The fishermen themselves was at first sceptical, but gradually opinion swung in favour of the part-decked boats, and from 1855 onwards they were built first in Buckie and later other boatbuilders followed. 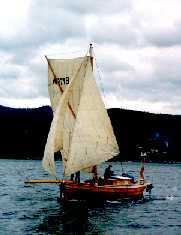 Another traditional model of fishing boat used in the Moray Firth was the "Scaffie" or "Scaith", 40 to 45 ft in length, and worked by a crew of five men. Scaffies were in wide use until the late 1800s when they were replaced by the larger fifies and “Zulus”. In 1878, in Lossiemouth, William "Dad" Campbell came up with a new design that became famous as the zulu. It was named zulu because of the Zulu Wars in South Africa raging at the time. The zulu combined the straight stern of the fifie with the raked stern of the scaffie. Zulus could reach a length up to 90 ft, carried large sails on masts up to 70 ft, and they were fast sailers, regularly making 10 knots, as they hurried herring catches to market. As the boats grew steadily larger the need for proper harbours increased. In the north-east Fraserburgh was reckoned to have thr best harbour in the region, with 10 ft of water during neap tides. It was built about 1546 as part of the development of the town by the Fraser lairds of Philorth from the original earlier village of Faithlie. The town has the distinction of having Scotland’s oldest modern lighthouse, established in 1787. The building of a harbour at Aberdeen had begun in the early seventeenth century, and to the north, Peterhead's original harbour, known in the early days as Port Henry pier, was first built in the 1590s shortly after the town was granted Royal Burgh status. Portsoy harbour was built in the late 1500s and the town had a lively trade. Banff traded with the Hanseatic League in the twelfth century, and the harbour was built in the 1770s and a fishing communikty grew up in the suburb of Scotstown. Scotstown was the home of my Grandfather in the late 30s and 40s, and it was here me and my mother went to live during our visit in 1948-49. 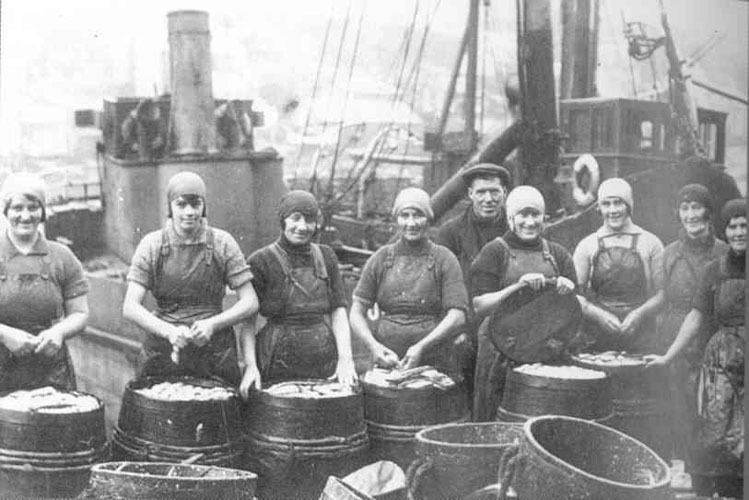 Herring has played an important role in Scotland's fisheries for many centuries. The migrating herring shoals off the coast of Scotland were first caught and exploited by the Dutch in the twelfth century, and the method of gutting, salting and packing of herring seems to be a dutch invention. There were traditionally two ways of preserving the herring : "red" herring were made by smoking whole, salted fish above wood fires for four to six weeks in specially built smokehouses; "white" herring were preserved by gutting them and packing them tightly in barrels between layers of salt. The standard technique for cathing herring was the drift net, a relatively simple technology that in essence remained unchanged until the 1960s. The drift net is shot so that it hangs like a curtain in the sea, with a line of floats attached to the upper edge and weights to the lower. In the early nineteenth century the nets were home-made from linen or hemp and a drifter would shoot perhaps twelve of these, joined to form a wall of net in the water. In the night when the herring shoals followed their plankton food to the surface they brushed into the hanging folds. As boats grew bigger the number of nets in the drift increased. By 1860 a drifter might carry twenty-four nets, each 120 ft long and 20 ft deep, and the "wall" of the drift would extend about half a mile from the boat. In the 1860s cotton nets were introduced, a major advance, as the cotton was lighter to handle and fished better. The nets were strenghtend by soaking them in an extract of oak or birch bark - a process called "barking". The herring fishery evolved as a great annual event. 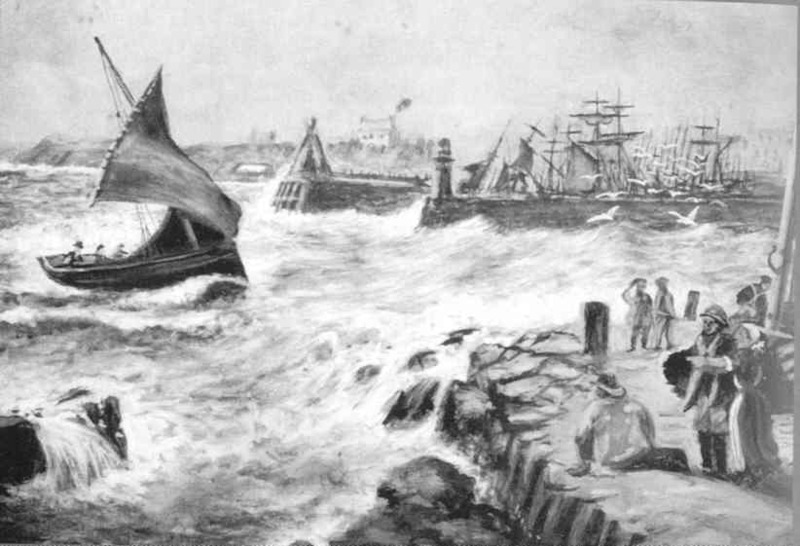 In 1848 - the year of the great disaster - it was reckoned that about 3500 boats were active along the east coast of the mainland, crewed by an estimated 17 - 18 000 men. In addition came the number of shore jobs as gutters, packers, coopers, chandlers, carters, shopkeepers, boat-builders, sail-makers - all dependent on the herring. The barrels were made by an army of coopers from spruce staves imported from Scandinavia. In the 1830s, in the Firth of Clyde, men began to use driftnets in a new way. Instead of shooting the curtain of net and passively waiting for a shoal to blunder into it, they dragged the net through the water and entrapped any herring they encountered. The first ring net was made by sewing drift nets together to make a trawl. Ring nets were in use in Norway in the 1760s for the taking of herring. 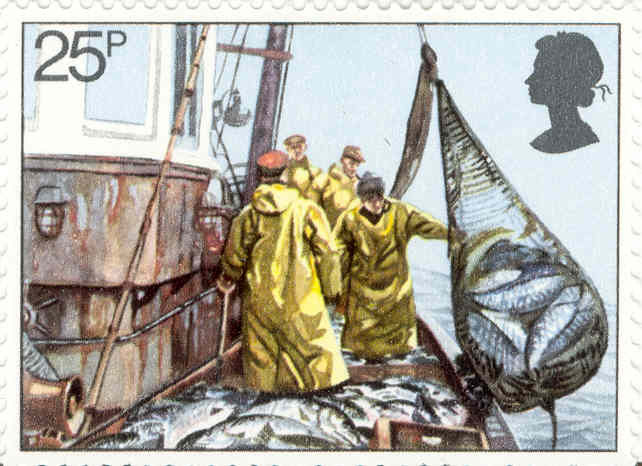 This type of fishing was often called trawling, but came to be distinguished, especially in relation to herring, by the more specific term of ringnetting. 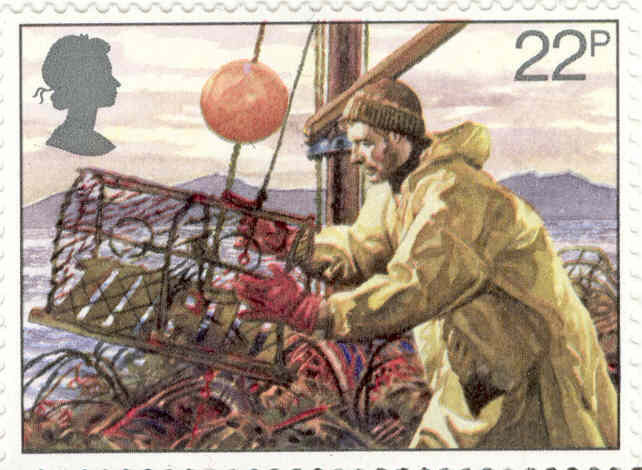 Ringnetting was to develop into a sophisticated method, a forerunner of the efficient - some would say deadly - purse seine that made its appearance in Scottish waters in the 1960s. The boats worked in pairs. One boat shot the net and the partner picked up one end before the two vessels towed the net and turned towards each other to entrap the shoal of fish. Though some unsuccessfull attempts were made in the 1860s and 1870s in equipping the boats with steam-power, they first came in regular use around the turn of the century. 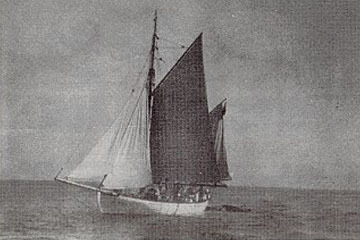 Most early steam-drifters were built with wooden hulls in Yarmouth and Lowestoft, but these proved to need considerable strenghtening for the more northern waters. 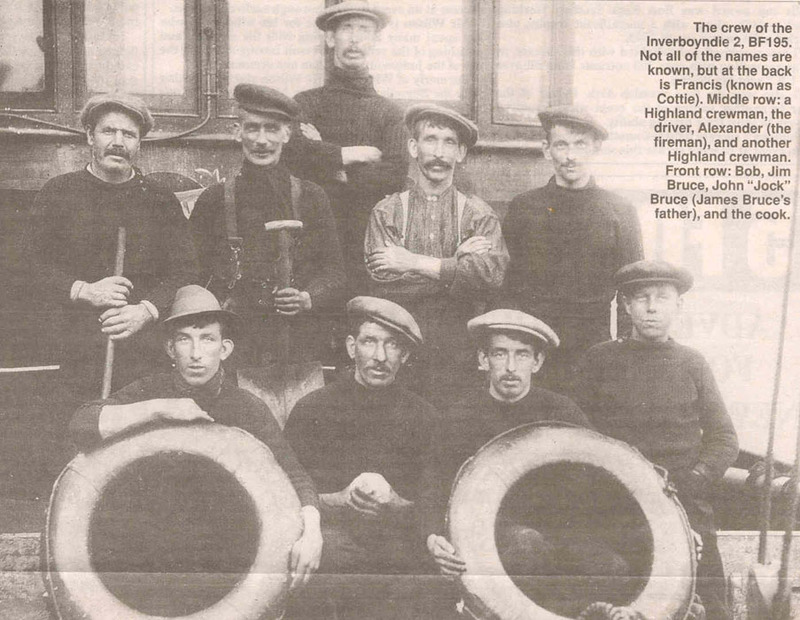 Steam-drifters were produced in yards in Portgordon and Buckie from 1903 and in Cullen and Portknockie from 1906. These vessels ranged in length generally between 75 ft and 90 ft. The sailing drifter however took a long time to disappear. For one thing, they were much cheaper to build and run : a zulu might cost £800 against the £3000 required for a steam drifter of similar size, and the wind was free whereas coal was consumed in the new engines by the ton, not to mention the need to ship and pay a fireman to look after the boiler. 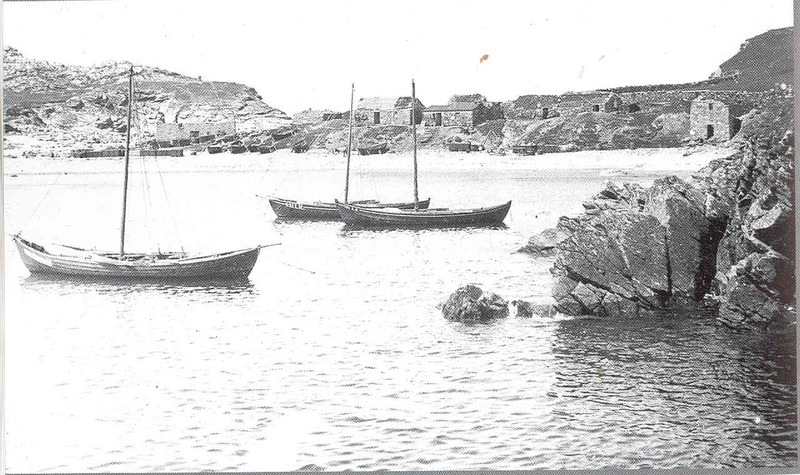 In 1914, sailing boats still comprised 72 per cent of the Scottish fishing fleet. By 1925 the proportion had dropped to 54 per cent, and finally in 1967 the number dropped to none. Steel hulls made their appearance very soon in the history of the steam fishing boat, but the wooden hull was slow to disappear. 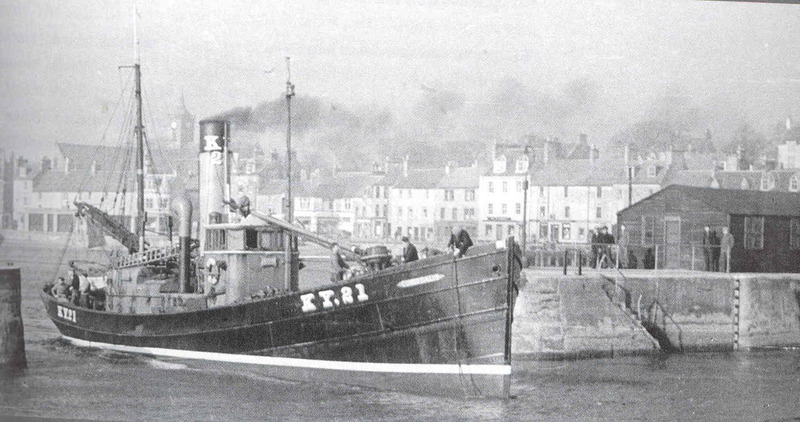 The last wooden steam-drifter was launched from Buckie in 1930. The last steam-drifter with a steel hull was built in 1932 in Aberdeen and was operating until 1956. Hardly had steam begun to displace sail than it too was challenged by the oil-fired internal combustion engine - first installed in the old fifies and yoles - and then by the Kelvin petrol/paraffin engines and eventually the diesel motor. By 1919 - the year my mother was born - the number of motor boats had risen to 1844, representing 23 per cent of the registered Scottish fleet. Looking back on a life at sea. For many North-east folk the lure of the sea is a powerful force, and for Banff man Mr. James Bruce, the sea and those who sail on it are at the centre of a long-running fascination. Erstwhile fisherman Mr. Bruce has made a life's hobby of collecting photographs, books and documents featuring the stories, characters and facts of the area's maritime heritage. Today, over 30 years since he left his seafaring days behind him, Mr. Bruce and his wife Audrey still live a stone's throw from the sea, in Fountain Park Street, Banff, and the evidence of his family's maritime history is all around. Covering one wall of the sitting room, a fleet of boat pictures offer an illustrated history of the changing face of fishing over the years. Sepia photographs, etchings and paintings reveal the transformation of fishing vessels from the tiny open sail boats through the steam and sail Zulu boats which replaced them, to the steam drifters which crowded the North-east's harbours until they themselves became obsolete in the 1950's. For many years his father was harbour master at Banff, and when the harbour closed to commercial operations, Mr. Bruce salvaged account books dating back to 1888, in which catches of fish landed at Banff are recorded in the old ink and immaculate copperplate of a previous era. 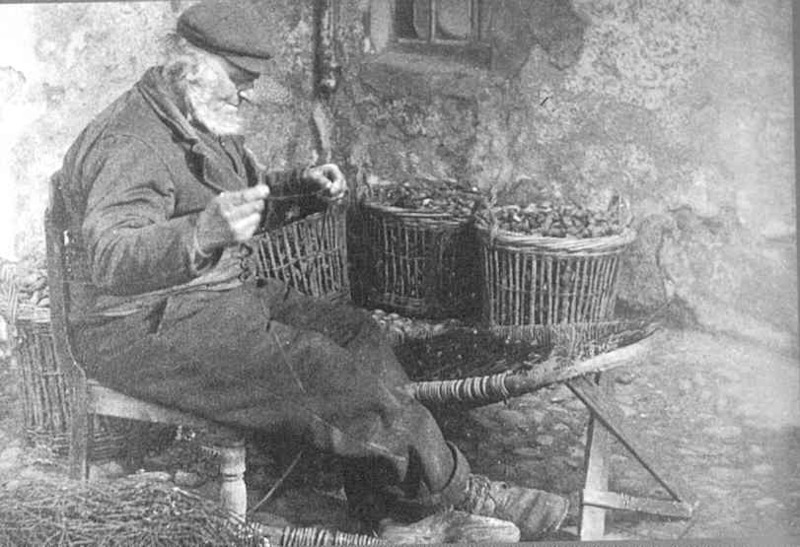 Mr. Bruce can trace his family's association with fishing in the area back to 1875, when his grandfather, drawn by the lure of the then renowned Banff Harbour, left Portknockie to build a new home for himself and his family in the town. 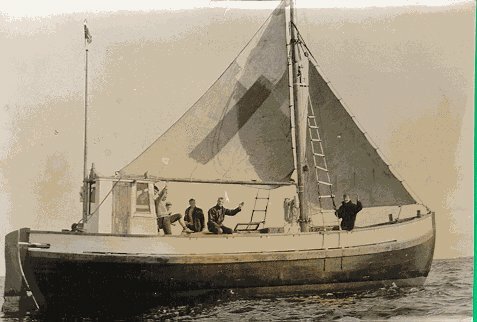 He had his first boat built at Green Yards shipyard in Banff, and named it the "Jessie Mair Bruce" after his wife. By 1910 it was time to trade up, and Mr. Bruce commissioned the steam boat the "Inverboyndie", which went to sea skippered by Mr. Bruce's uncle (my grandfather George Gault), and manned by the other brothers and two highlanders resident in the Bruce home. Some years later the crew decided to buy a still larger boat, which they christened the "Inverboyndie 2". For the Bruce family, the "Inverboyndie 2" was a lucky boat, but in time its luck must have run out. Mr. Bruce's efforts to trace what became of it after the family sold it, revealed that her remains lie on the ocean bed off Dell Rock, where she went down in 1932. After selling the "Inverboyndie 2", Mr. Bruce's grandfather and his crew hired the "EJM" (Eliza J. Mair), and in keeping with the tradition of the times, brought it into Banff harbour for their wives to scrub out the cabin and decks. The women of the Bruce household came close to striking an early blow for women's lib, when rats swarming over the decks meant that they almost refused to go aboard the boat to clean it. Following the fish on the annual trail around the fertile fishing grounds - from Shetland in the early months, Mallaig for March, Peterhead and Aberdeen for the summer, then down to Yarmouth, before heading home for Christmas - took the boats and their crews away from home for long stretches, but James Bruce explains that there were few complaints : for the men and their families, that was just the way it was. For James Bruce there was never any question that his career would be anywhere but the sea, and at 14 years old he joined the crew of a drifter taking supplies and liberty parties out to boats in Scapa Flow. At 16 he joined the Portknockie fishing vessel the "Sincere" as a cook, rising to the position of fireman, for an extra ten shillings a week, when the previous incumbent left. The job of cook often fell to the youngest member of the crew, and Mr. Bruce has fond memories of his job training : “They would shove you in the galley, shut the lid on you and tell you to get on with it”, he said. As fireman, Mr. Bruce's job was to stoke the boiler and look after the engine; it also made him one of the three crew members on a wage ; the rest of the 10-strong crew earned their money from the fish caught - no fish, no money. Often the driver would take the boat out and the fireman would bring it back in, and if anyone was off, there would be very little sleep at all. Mr. Bruce describes the process of landing fish in Fraserburgh : "You would put some fish in a basket, then someone would run it up to the market for the salesman to auction off the catch. Whoever bought it would then come down to the boat to land the fish and salt them into huge barrels called kits." On average the crew worked four hours on, four hours off. After a season aboard the "Sapphire", Mr. Bruce joined the "Corriedoune", again as a fireman, and it was a time that was to leave him with many adventures to recount. During the war, the convoy routes in Scapa Flowwere no-go areas for fishing boats, and Mr. Bruce recounts how the "Corriedoune" came close to paying a heavy price for staying off limits. One night in 1943, the "Corriedoune" was fishing in forbidden waters with no lights on, when a crew member chanced to overhear the turbines of a huge battleship bearing down on the small drifter. This, Mr. Bruce adds, was in the time before ships were equipped with high-sensitivity radar; it would have been quite possible for the ship to run right through the hapless "Corriedoune" almost without noticing, The "Corriedoune" immediately put out a light for show, and the battle ship sailed on around them, ploughing right through her nets. Weeks later, they were to hear the tale from the other side. After getting chatting with a Navy sailor in Fraserburgh, the crew listened in silence as he bemoaned the hours he had spent cleaning fishing tackle out of the propellers of his boat, the "King George the Fifth", following a mystery encounter with a fishing vessel in Scapa Flow. Following a spell in the Merchant Navy, Mr. Bruce came home from the sea for good in 1968, when hr took up his old duties as fireman again, responsible for the boilers in Chalmers Hospital. When oil came, the town and the harbour just saw pound signs in front of their eyes and, apart from one Bailie McGee, who wanted to stand up and preserve old Torry - he was just shoved into the background, there was no way in the early 1970s they were going to preserve old Torry. The piers and quays were modernised. As the oil boom was starting in the early 1970s, some of the fishermen who were getting old or fed up with the hours found the oil jobs attractive. Being away fourteen days didn't bother a fisherman - he was accustomed to hard work day and night for fourteen days anyway. They took jobs such as firewatching. A lot of fishermen went off there, not immediately but once they saw the lie of the land and saw what the oil companies were needing, they went. They often got jobs as riggers because they were good at splicing steel warps, which many people couldn't do on 3-in. steel wire on a rolling boat. They got good jobs. Maybe in a fortnight out there (on the North Sea), they were working ten-hour shifts - even twelve hours didn't bother them - they got 10 hours off, in a bed, the best of food, regular times, the best of wages - all so unusual for them. The trawlers suffered with them going, they were't being replaced. The trawlers started going away with crews with no experience, They really weren't suitable - in the mid 1970s, the cvompanies found it wasn't economical, if they couldn't get crews to really work the trawlers. 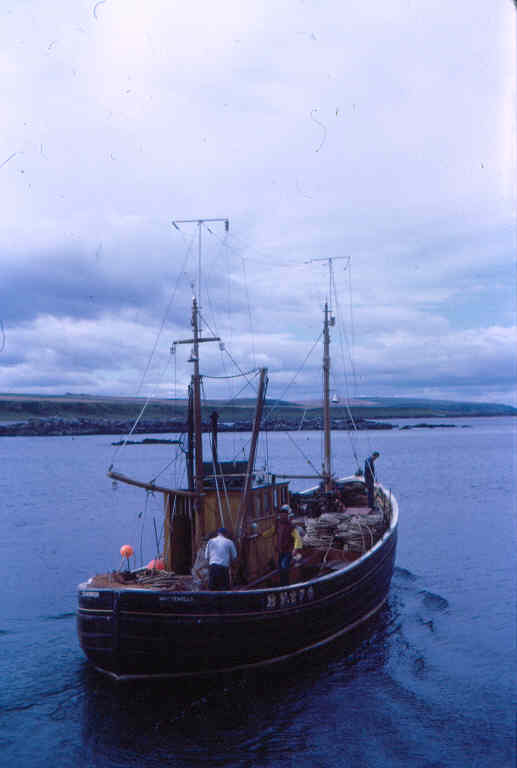 The Aberdeen trawlwr fleet declined then - maybe over ten years, from the early 1970s to the early 1980s. The only way you could carry on was to get genuine fishermen, experienced, and keep away from the toerags. Today however it seems the fishing industry is slowly growing again. The people in this area have been drawing a living from the sea for thousands of years. The salt in the blood has been passed down through the generations. It is up to us to ensure it does not cease now. Fishing life from a poet's view. Poems by James Slater from Portsoy, written in the early 1960s.